The title of this post reflects my state mind and current relationship with Time Machine. 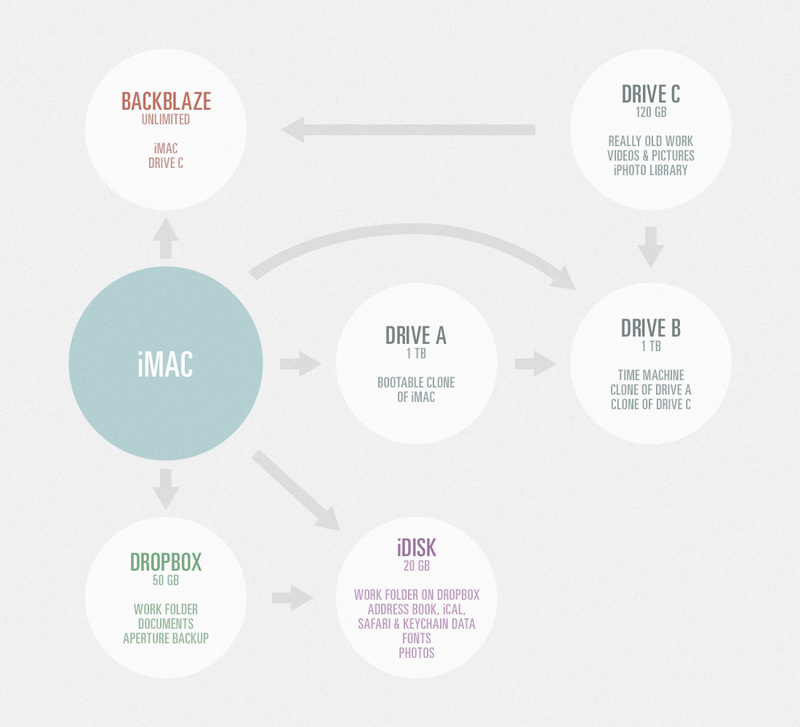 But first, a few thoughts on backups in general. Go back a generation and backing up involved a rearview mirror in your vehicle. Today it denotes the need for an overall strategy to preserve the memories that are dearest to you, as well as archiving your business if you have one. And since we — or, I — like to focus on the life of a creative professional, that’s where my mind goes when I think about backing up my data. Recently, Frank Chimero listed his archiving strategy when describing his digital setup. In a follow up, Antonio Carusone describes how he moved from a process of backing up when he “remembered to do so” to a redundant solution using 6 locations (with a lovely diagram to illustrate it, a great way to keep your overall setup easily memorable). And lastly, I cannot talk about backing up without linking to Patrick Rhone’s post on his 3-2-1 strategy. My own process is similar, making use of a 1 TB external drive for weekly clones of my hard drive and video storage, a 750 GB external drive for Time Machine backups, a 120 GB external drive for monthly clones of my hard drive, and Dropbox for everything that is important (even my music and photos). The part of the process that has really gotten on my nerves in the past has been Time Machine. Not that the technology was bad, but merely slow. I used it with a 500 GB Time Capsule for almost two years. The issue with that configuration is that the backup process took too long via a wireless connection, even to the point where the performance of my Macbook was affected. I started to dread seeing Time Machine start up in my menubar, often canceling the scheduled backup. Which is not a very good way to ensure an up-to-date copy of your work. Updated the schedule — I used a small utility called TimeMachineEditor to schedule my backups every 4 hours instead of two. With all my data being synced to Dropbox as well, every two hours is overkill. Changed the drive — I’ve decided that backing up via wireless — at least regularly — is just a bad idea. I now point Time Machine to a tiny, small, very quiet external drive. At 750 GB, it’s more than enough space for my needs. Changed my preferences — in the Time Machine Preference Pane, I unchecked the option to display the status of Time Machine in the menubar. The change has been great, because the old setup had become a point of irritation and stress. Now I don’t even know that a backup is taking place. The combinations of a quiet drive on a faster connection and having no visual notification that a backup is in progress has put the entire process out of my mind. Which is where it should be.